A prosthesis is an artificial body part and people with limb loss often wear a prosthesis to replace all or part of an arm, leg, hand or foot. 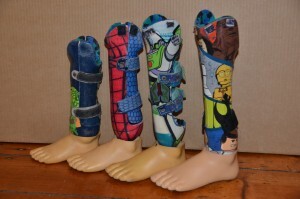 A prosthesis is used to replace the function of the missing limb and/or is used for cosmetic reasons. The plural term for prosthesis is prostheses. Prostheses are named after the body part they replace. The term ‘trans’ is used for a prosthesis where the limb loss begins part way through a long bone (eg.’Trans-Femoral Prosthesis’ refers to an artificial limb replacement where the knee joint has been removed and part of the femur or thighbone is intact). The term ‘dis’ is used for a prosthesis where the limb loss occurs at the level of a joint (eg. ‘Knee Disarticulation Prosthesis’ or ‘Elbow Disarticulation Prosthesis’). Partial foot or hand prostheses are designed for persons missing only part of their hand or foot.